Dunkeld, a rural town in western Victoria, is on the Glenelg Highway at the southern end of the Grampians range. It is 30 km north-east of Hamilton. Overlooking the town there is Mount Sturgeon and, further north, Mount Abrupt. Both were named by the New South Wales Surveyor-General, Thomas Mitchell, when returning from his Australia Felix expedition in 1836. The Dunkeld settlement was known as Mount Sturgeon until 1854, when it was named Dunkeld. The Woolpack Inn was opened in 1845 at the future site of Dunkeld, being positioned near the routes to Port Fairy and Portland from Geelong. During the next decade there came a post office (1852) and a school (1855). The largest group of settlers were of Presbyterian affiliation (in common with much of the Western District), and a Presbyterian church was built in 1865, the congregation having outgrown the Woolpack Inn. The Presbyterian influence probably explains the change of name, Dunkeld being a place in Perthshire, Scotland. In 1865 the Mount Sturgeon run was subdivided and one of the portions was acquired by the Armytage family. They began construction of the Mount Sturgeon homestead and became a leading family in Dunkeld. 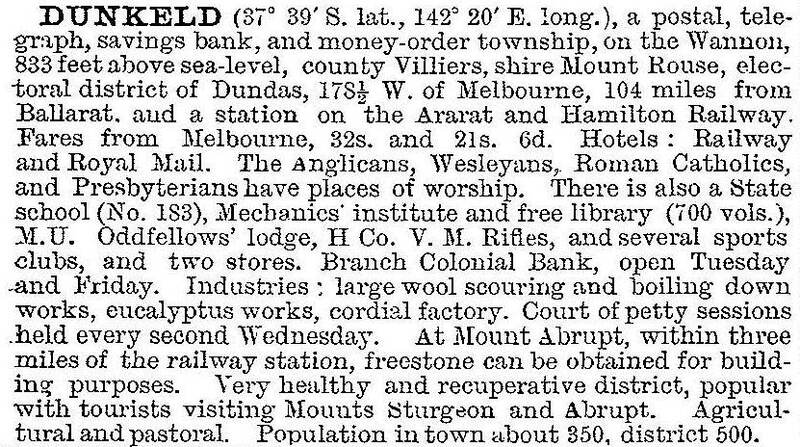 In the year of the Armytages’ arrival Bailliere’s Victorian gazetteer recorded Dunkeld as having three hotels, a flour mill, vast supplies of stone for building and milling, and a small population of farmers (most of the good land near the township having been purchased by squatters). Dunkeld became mainly a pastoral area, with some areas growing fodder and fodder seed. Stone quarrying in the Grampians was a small industry, but there has been continuous milling of timber taken from Victoria Valley in the Grampians. Also enduring has been the use of Grampians honey flora by Dunkeld apiarists. After World War II several remaining pastoral estates came under subdivision for soldier settlement. The resulting increase in population and the improvement in local transport lead to a consolidated school being opened in Dunkeld in 1952. It went to year 10 until 1965 when secondary students were transferred to Hamilton high school. In 2014 the Dunkeld consolidated school had 104 pupils. In the early 1970s Dunkeld’s population dipped below 400 people, but since then there has been an increase. Dunkeld has a small shopping centre, a hotel, a caravan park, a recreation reserve, a bowling club, tennis courts and a swimming pool (1966). There are Anglican, Catholic and Uniting churches. The memorial park includes a war memorial, marking the fact that Dunkeld proportionately enlisted the fourth highest number of recruits in Victoria during World War I. A sawmill is located in the town and there is another in Victoria Valley. Resisting the trend for the closure of country race courses Dunkeld has upgraded its course for the annual race meetings. A historical museum is accommodated in the former Presbyterian church (1865) and there is a visitor information centre. The Mount Sturgeon homestead is near the Wannon River which runs between Dunkeld and the Grampians. Alan Myers QC, the son of a long-standing Dunkeld family, has invested substantial money and effort in his home town. In 2013 he purchased the Uniting church building for use as a cultural centre. The Royal Mail Hotel has been extensively revamped, and received dining awards. The Conference Centre attached to the hotel was damaged by fire in 2013. The census population of Dunkeld and environs in 2011 was 751. At the 2011 census farming accounted for 29.8% of employment.